Knee buckling happens, when the knee joint loses its stability and becomes weak. Your knee is a rather complicated structure, which includes bones, two joints, tendons, ligaments and cartilage. All these components work together to provide smooth movements, shock absorption and wide range of motions. “Giving way” is a common problem among adults. One cross-sectional study has found that among more than 2300 people between 36 and 92 years old, nearly 12% experienced knee buckling at least one time in the course of the past three months. In the majority of members with history of knee buckling the episodes were multiple. In 13% of cases, buckling had resulted in falls. Although knee instability is usually associated with joint inflammation (arthritis), specialists say that more than half of people with weak knee don't have any signs of this disease found during X-rays examination. The good news is that knee buckling is treatable and preventable problem. To relieve inflammation and cope with unpleasant sensations, you can use ice, compressions, over-the-counter painkillers and supportive accessories like braces, bandages. In severe cases, prescription medications or surgery may be required. Doctors say that strengthening your leg muscles can help improve knee buckling or prevent it. Exercises were found to be a perfect option for supporting the knee, increasing range of movements, enhancing flexibility and alleviating stiffness. Physical therapists design physical therapy plan individually, depending on the severity of condition and overall health. Typically, rehabilitation for knee lasts for 4-6 weeks. 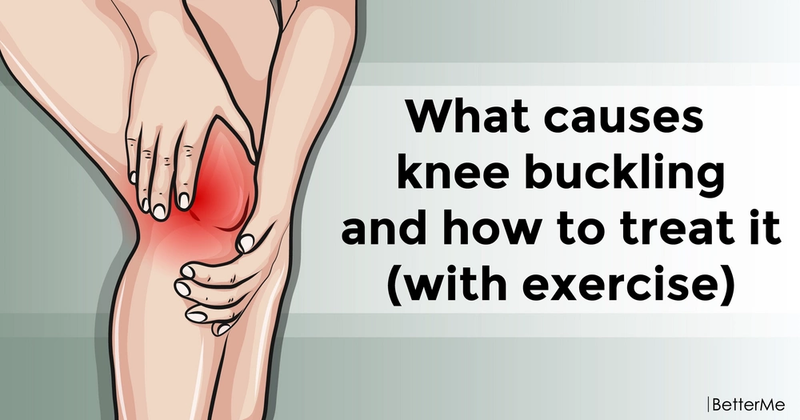 It is usually recommended to continue doing exercises to maintain knee health. But don't try to perform complicated and tough exercises, if you aren't fit enough. It's very important to start your program slowly and gently, increasing leg strength and flexibility bit by bit. Your progress is in your hands. So don't give up and build your success carefully.